Who doesn't love peanut butter? I know there might be someone out there who doesn't but pb never gets old to me. 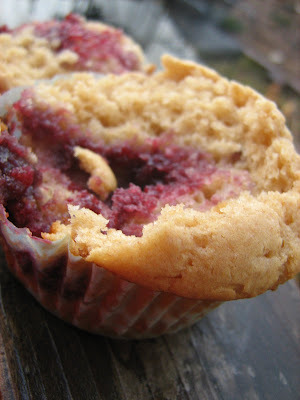 These muffins are like a pb&j sandwich for breakfast, except better. 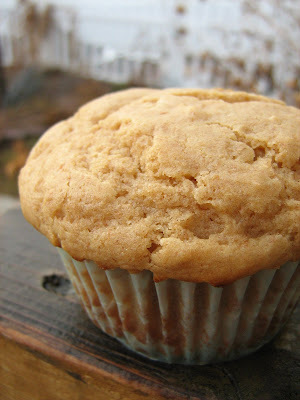 I had to make some muffins for a morning get-together and these muffins just looked tasty over at myrecipes. I double a batch and they were ready in a jiffy (ha- I didn't even realize that was kinda a pun because of Jif) My kids loved them and I did too. 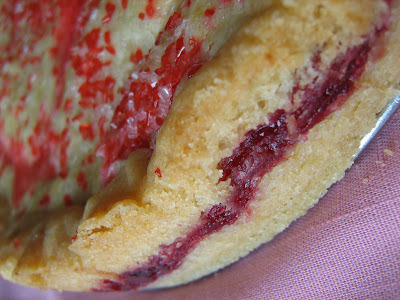 I used Marionberry Jam because that is what we had hanging out in the fridge. I am sure almost any flavor of jelly or jam would go great with these. Perfect for breakfast or a snack. Don't use a natural-style peanut butter in this recipe; it won't have enough sugar or fat to help the muffins rise. Preheat oven to 400°. Lightly spoon flours into dry measuring cups; level with a knife. Combine flours, sugars, baking powder, and salt in a large bowl; stir with a whisk. Make a well in center of mixture. Combine milk and next 4 ingredients (through vanilla); add to flour mixture, stirring just until moist. We were having dinner guests and I wanted to make an impressive dessert in half the time. I chose cheesecake bars but couldn't decide which flavor would please everyone, so I made both! When in doubt, make more, right? I thought that the lemon blueberry would give a nice, light, fruity option and the chocolate-pumpkin would satisfy the chocolate-craving dessert eaters. As it always does, the vote was split. Half of us liked the lemon better- half liked the chocolate better. 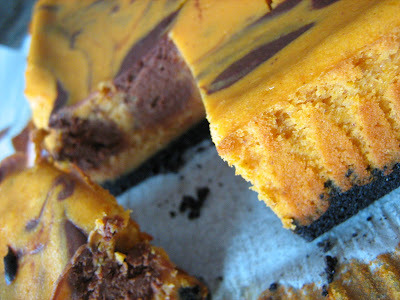 I liked the chocolate-pumpkin version better because it tasted less like cheesecake and more like something very pumpkiny. Isn't that a great description? Anyway, just laugh at me- it is fine. 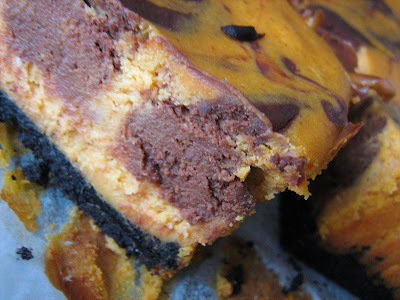 To create swirls, drag the blade of a paring knife through the chocolate and pumpkin mixtures several times to make a marbled pattern. Cool in pan. Cover; chill until firm, at least 2 hours (and up to 2 days). Using overhang, transfer cake to work surface. With a knife dipped in water, cut into 16 squares. My family loves fish, especially tilapia. I saw this healthy recipe in Family Circle magazine and wanted to try it. 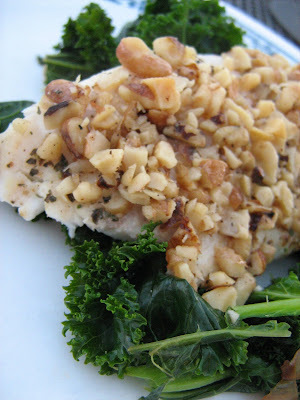 I love recipes where the fish is coated in nuts and this one topped it off by adding one of my favorite foods-dark greens. 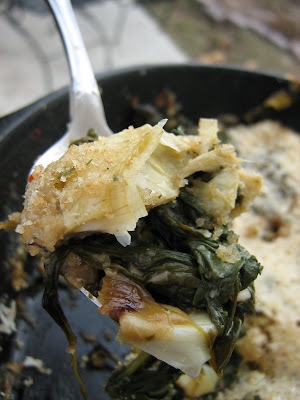 The recipe called for Swiss Chard, but it was too expensive, so I substituted Kale. Funny side note- My hubby guessed what greens we were having! I couldn't believe that he correctly identified kale! This fish was amazing. I was surprise at how much flavor the quick brushing of dijon mustard/fat-free mayo gave this fish, along with the dried basil and walnuts. It was really delicious. We used Tilapia loin filets from Costco, which are thicker then the typical fish filet. I think that added to the tastiness of the fish. I am so glad my kids love fish. The barley pilaf is a recipe I remember my mom making when I was growing up. I reduced the amount of butter and it brought back some fun memories of being a kid. 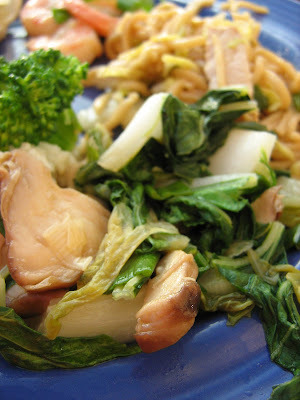 You can also add cooked chicken to the barley pilaf and turn it into a main dish. You have got to try this fish- it was really, really good! 1. Heat oven to 425°F. Coat a baking sheet with nonstick cooking spray. 2. Stir together mayonnaise and 1 tablespoon of the mustard. Finely chop walnuts. Brush tilapia with mustard mixture, then sprinkle with 1/2 teaspoon basil and 1/8 teaspoon each salt and pepper. Press 2 tablespoons chopped walnuts onto one side of each fillet. 3. Place tilapia, walnut-side up, on baking sheet; bake at 425°F for 15 minutes or until fish flakes easily. 4. Heat oil in a large skillet over medium-high heat. Add onion; cook 4 minutes. Stir kale and season with salt and pepper. Saute for a few minutes and then cover and cook, until tender, about 6-8 minutes. Melt butter in a large Dutch oven or heavy-bottomed pot. Add onion and saute until tender, about 5 minutes. 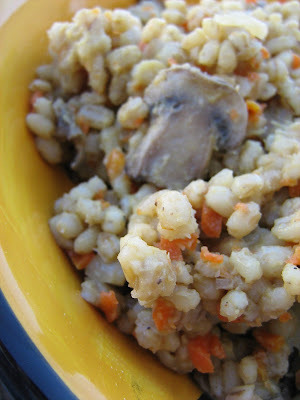 Add barley, mushrooms, and shredded carrots, and cook for 2-3 minutes. Add chicken broth and bring mixture to a boil. Reduce heat to a simmer and Cover. Cook for 45 minutes or until barley is tender and liquid is absorbed, stirring occasionally. Season with salt and pepper. This week's Tuesday's with Dorie recipe, Fresh Ginger and Chocolate Gingerbread, was chosen by Heather of Sherry Trifle. You can find the recipe on her blog. I thought it was sort of funny that she chose this recipe, because it was in the running for my choice when I started my list of things I might choose when my turn came. The picture in the book looks gingery and delicious. 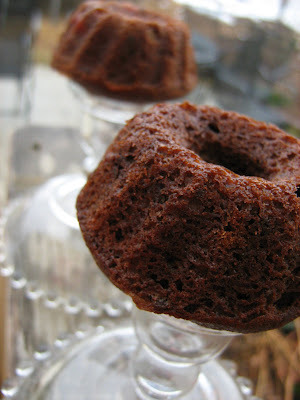 Dorie says to make this in a 9x9-inch pan, but I wanted smaller servings, so I went with my 2 mini-bundt pans and I also had enough batter to fill a mini-muffin pan. I added frozen cranberries to half of my batter and left out the stem ginger in syrup. I took these to a party where there was a chocolate fountain, so I figured that people could give them a nice showering of chocolate on top, if they wanted to. Overall, the results were split. Some people loved these- especially with the cranberries. Others thought they were too chocolaty. I actually didn't get to try anything but a crumb, but they all disappeared, so I guess there were enough people who liked them, right? Check out what everyone else thought by checking out the Tuesday's with Dorie blogroll! 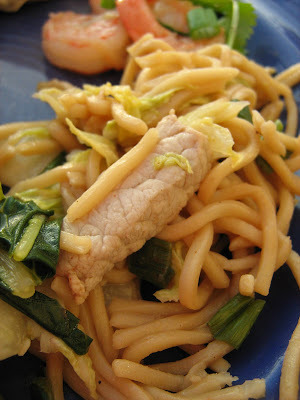 When I got the January 2009 issue of Cooking Light, the Chinese New Year menu caught my eye. It looked like the perfect menu to serve up at a party. I have never celebrated Chinese New Year, but thought that this menu was a good excuse to invite people over and have a party. We actually celebrated the Monday before since everyone was out of school and a few people were off of work. We had 12 adults and 5 kids that ate with us and the amount of food was perfect. This menu appealed to me because we love to eat stir fry and potstickers are also a family favorite. Also, all of these dishes came together really fast, so we didn't have to spend all day in the kitchen. I made the Mango pudding the night before and got the potsticker filling ready early in the day. Overall, we loved this menu. The stir fries were delicious and the sauces were flavorful. We topped the pudding with whipped cream when we served it and it was a big hit. 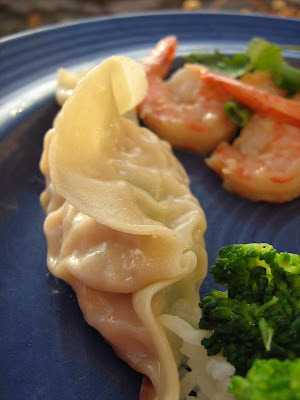 I asked my husband if he liked these potsticker more than the ones that I make very frequently (Check them out HERE) and he wasn't sure because these ones were really good. If you need something quick to celebrate Chinese New Year tonight, try one of these- any or all of them are real crowd pleasers! 1. Coarsely chop 2 mangoes. Dice the remaining mango. 2. 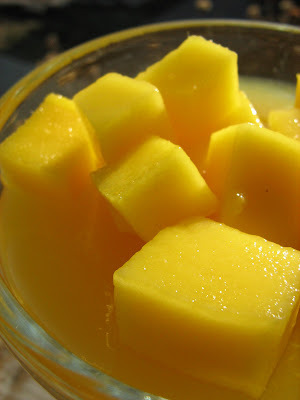 Combine coarsely chopped mangoes and 1/4 cup water in a blender; process until smooth. 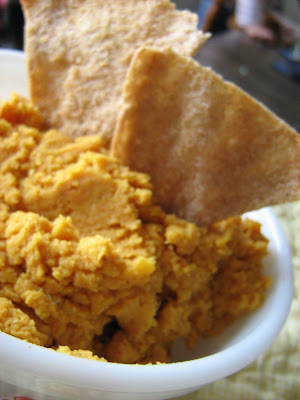 Press puree through a fine sieve over a bowl; discard solids. 3. Bring 3/4 cup water to a boil in a medium saucepan. Add sugar to pan, stirring until dissolved. Remove from heat. Stir in the remaining 1 1/4 cups water. Sprinkle unflavored gelatin over water in the saucepan; let stand 1 minute. Add the mango puree, stirring with a whisk. Pour the mixture evenly into each of 8 (6-ounce) ramekins or custard cups. Cover and chill overnight or until set. 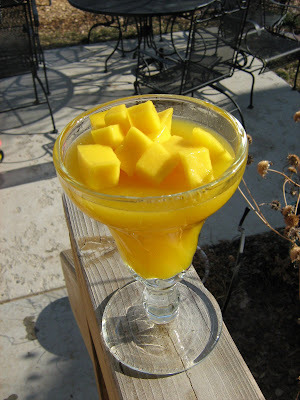 Top evenly with diced mango. 4. Place cream in a medium bowl; beat with a mixer at high speed until stiff peaks form. Serve with pudding. I have seen roasted garbanzo beans popping up all over the place in the blogging world. 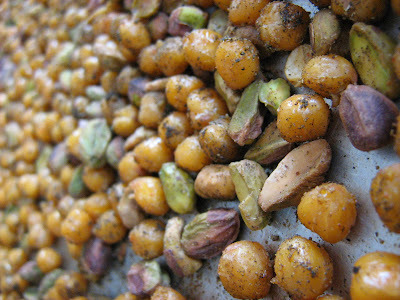 I thought this particular recipe looked really good with the combination of spices and pistachios. And it was. Does anyone else think it is funny how some cans/brands of garbanzo beans contain really small beans and other cans/brands of them contain huge beans? I think it is a little wierd, but obviously you can see that these were on the smaller side. They also get smaller as they are roasting. I reduced the amount of olive oil that the chickpeas were tossed with, just because I think you can often reduce the fat content in recipes and still get a great result. This is a healthy snack, that is really great to grab a handful of as you are busy doing whatever throughout your day. I am going to make this again! Preheat the oven to 400°. 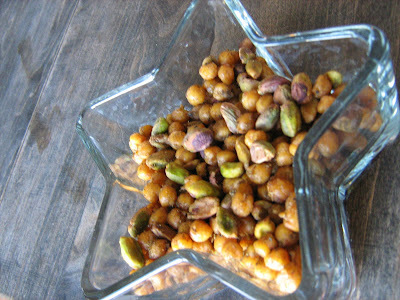 Place the chickpeas in a medium bowl and discard any loose skins. Toss with the olive oil, salt, black pepper, cumin and cayenne until evenly coated. 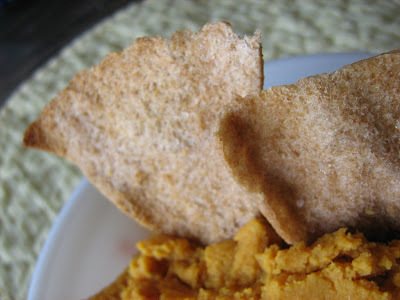 Spread the chickpeas on a large rimmed baking sheet and bake, stirring occasionally, until golden and crisp, about 25 minutes. 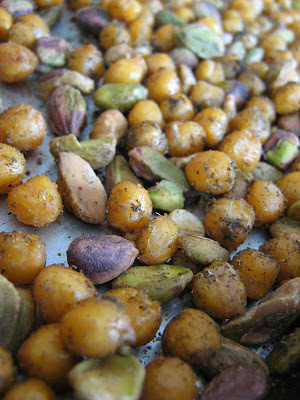 Remove from the oven and quickly stir in the thyme and pistachios, if using. Bake until crunchy, about 10 minutes more. Let cool and serve at room temperature. 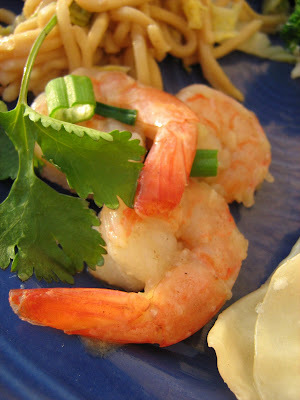 Coming Tomorrow- Cooking Light Night- Chinese New Year! I stocked up on cranberries when they were cheap at the grocery store and wanted to give this cake a try. I am always curious about the recipes in Dorie's Baking book that don't have pictures and it makes me want to try them. I happened to have an extra egg yolk hanging out in the fridge, so I mixed up the filling and the dough and let them sit in the fridge overnight. Very easy dough to put together. I baked this cake the next day and instead of using plain old sugar on top- I used some of my red and white decorating sugar. It was really good. 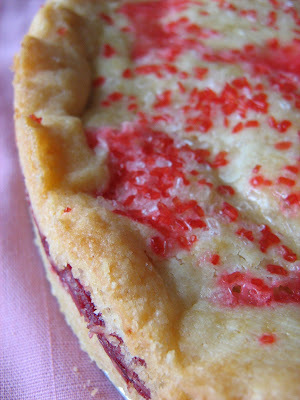 Tart and shortbread- A great combination. Grate the entire zest from the orange and remove the white pith left behind with a sharp knife. Slice between the membranes of the orange to remove the segments. Cut each segment into 1/4" pieces and place them, along with the zest, in a medium saucepan. Squeeze any of the juice left in the membranes of the orange into a measuring cup - you need about 1/4 cup total juice, if you don't get that much just add extra orange juice (or water if need be) to reach that amount. Stir the cranberries and 3/4 cup granulated sugar into the pan. Place over medium heat and bring to a boil - cook, stirring constantly, until the cranberries pop and the mixture thickens enough that your spoon will leave a track when you move it through. This should take around 5 minutes once it comes to the boil. Scoop the jam into the bowl and let it cool slightly - if it is still too tart, add enough of the remaining 1/4 cup sugar to even out the flavor. Allow to cool to room temperature then cover and refrigerate it until needed. In a medium bowl, whisk together flour, baking powder and salt. In a large mixing bowl, beat butter until creamy - about 1 minute. Add 1 cup granulated sugar and mix until completely combined. Add the egg and yolk - beat the mixture until combined. Mix in the vanilla. Add the flour mixture and stir by hand just until the flour has been absorbed. Divide the mixture in half and place each half on a piece of plastic wrap. Flatten each portion into a disk and cover with another piece of plastic wrap - place in the refrigerator to chill for 30 minutes. Working with one portion of the dough at a time, roll one piece out between two pieces of plastic wrap until it is large enough to cover the bottom of a 9" springform pan coated with nonstick spray. Carefully lift up the dough and lightly press it around to fit it into the pan. 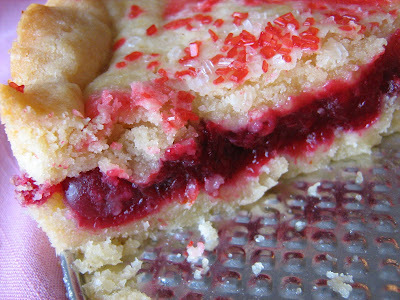 Scoop the cranberry filling on top of the dough and use an off-set spatula to spread it to an even layer. Remove the second piece of dough from the refrigerator and roll it out again to the same size as the first. Carefully flip the dough on top of the filling and use your fingers to lightly even it out so the dough completely covers the filling. Lightly brush the top of the dough with water and sprinkle the remaining 2 teaspoons granulated sugar on top. Bake until the top of the cake is a light golden and a toothpick inserted near the center comes out mostly clean - about 35 to 45 minutes. Don't you wish you had this snowy backdrop? Maybe you do and maybe you love it. I mostly wish it would melt away, although it is pretty sometimes. Enough about the cold weather and on to some delicious food. 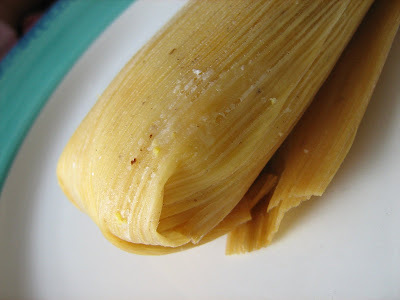 When I saw that Prudy made homemade tamales a couple of weeks ago, I immediately printed out the recipe and wrote her tamales into the menu. 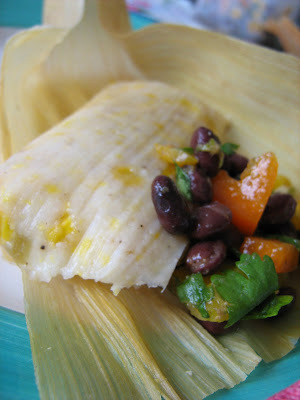 I have been wanting to make tamales from scratch, but was too scared for some reason. I haven't eaten them very often, if ever, but it sounded like an adventure-so, I went for it. Thankfully Prudy included step by step photos of the entire process, so I was able to make sure I was proceeding correctly. My son loved these! That is saying something. He is usually one of the pickiest eaters at the table. They were worth the effort. 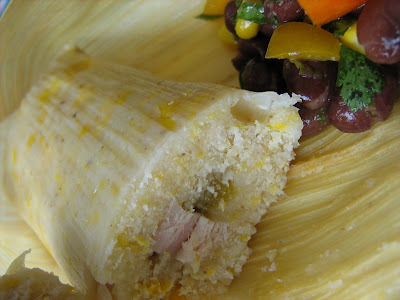 I made 2 fillings- cooked chicken with green chiles and taco-flavored shredded chicken. Both were delicious. 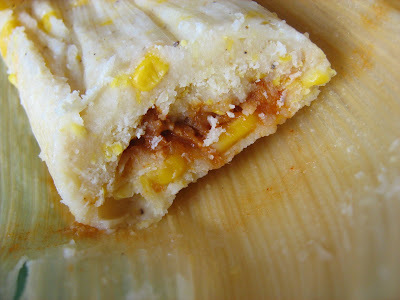 I am eager to try these again and play around with the fillings. 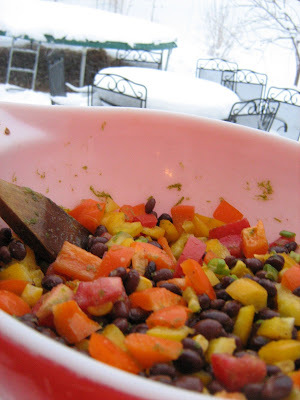 I also served Prudy's Black Bean Salad on the side, but opted for more beans and bell peppers and less corn, since the tamales had lots of corn in them. What a fancy Fiesta! Prudy's suggestion for turning this into a main dish:Add 2 cups each cooked brown rice and fully cooked meat, adding extra cumin, lime, and olive oil if necessary. I used leftover grilled chicken slices. 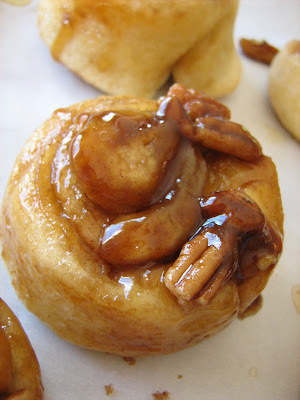 This week's Barefoot Bloggers recipe, Easy Sticky Buns, was chosen by Melissa over at Made by Melissa and taken from The Barefoot Contessa's latest cookbook, Back to Basics. Since easy is in the name of the recipe- you expect it to be just that, easy. And it was. I made a couple of changes. I didn't want to buy puff pastry and I had a pkg of Pillsbury refrigerated pizza dough in the fridge, so I made the swap. I wasn't sure how it was going to turn out, but I decided to go for it. I am glad I did too. It worked just fine. I just rolled out the dough and reduce the amount of butter by half and made it work. They tasted just great. Probably a little less sweet, but we saved some calories and still had a tasty breakfast sweet. Go see what the rest of the BBloggers thought by checking out the Blogroll. 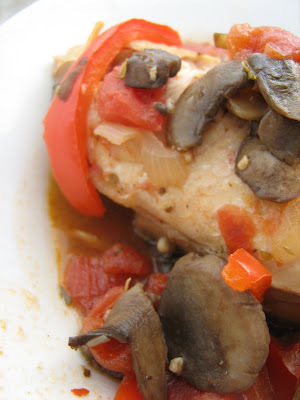 This week's Craving Ellie recipe, Chicken Cacciatore, was chosen by Peggy over at Pantry Revisited. You can go to her blog to get the recipe. This is a simple, hearty dish that I threw together on a Saturday afternoon. It was good, nothing wowed me, but we enjoyed it. Chicken and veggies, with yummy seasonings and a little sauce is always good. Go check out the Craving Ellie site to see what everyone else thought about this dish! In the bowl of an electric mixer fitted with the paddle attachment (I used a fork), combine the 6 tablespoons butter and half of the brown sugar. Place 1 rounded teaspoon of the mixture in each of the 12 muffin cups. Distribute the pecans evenly among the 12 muffin cups on top of the butter and sugar mixture. Melt the remaining butter/brown sugar mixture and brush it over the pizza dough. Sprinkle the remaining brown sugar over the dough and the cinnamon. Starting with the end nearest you, roll the dough up snugly like a jelly roll around the filling, finishing the roll with the seam side down. Slice the roll in 12 equal pieces, each about 1 inch wide. Place each piece, spiral side up, in the muffin cups. 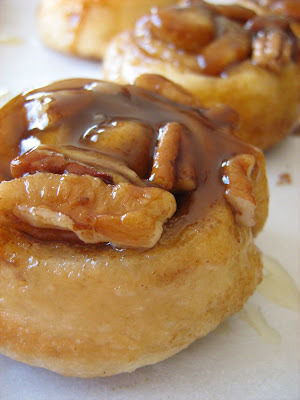 Bake for 15 minutes, until the sticky buns are golden to dark brown on top and firm to the touch. 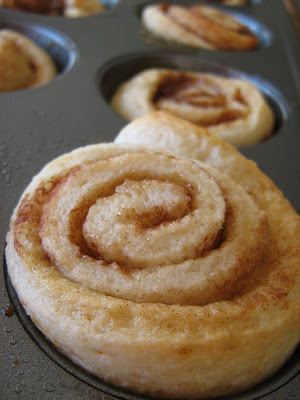 Allow to cool for 5 minutes only and then turn them out onto a piece of parchment. This is hands down, the best dip I have ever tasted, made, inhaled, smelled, looked at, dreamed about or seen. It is unbelievable. I wasn't expecting anything spectacular when I made this. 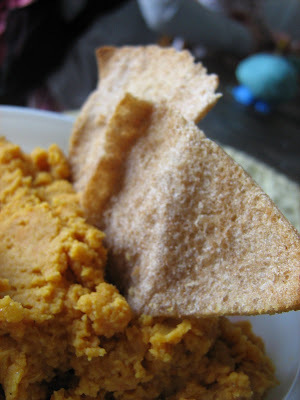 I had just about a cup of red lentils left in the pantry and I had done soups, wraps, and burgers, so I just searched red lentils at myrecipes.com and found this recipe. It sounded interesting and I had the lentils ready to go, so I mixed it up. Amazing! The spices, the flavor, the texture- I know that I rave about a lot of things but this was delicious and I wasn't the only one who thought so. Even the very picky kids that turn their noses up at everything I make when they come over to play with my kids, gobbled it down. oh and the pita chips too. Do what you have to. Find red lentils. Make this dip. I would've like to spread this on some flatbread and make a wrap, but you guessed it- There wasn't any left. I am making this again soon. I just have to make a trip to a Health Food Store and stock up on my yummy lentils. This dip tastes best at room temperature. Preheat the oven to 400 degrees. Cut or tear your pitas into triangles or pieces. Arrange them on a baking sheet. 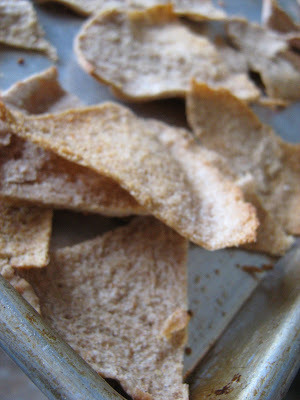 Coat pita pieces with cooking spray and season with garlic sea salt grinder. Toast in oven for 7-10 minutes, or until lightly browned and crispy. 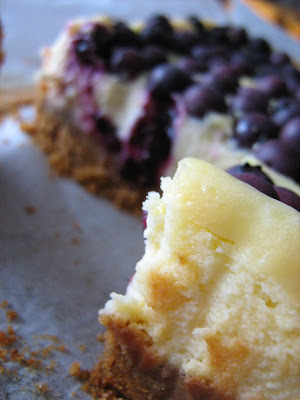 Tuesday's with Dorie- Berry Surprise Cake- My Pick! This week's Tuesday's with Dorie selection was brought to you by ME! That's right, it was my turn to choose and what a difficult task. When I joined TWD last March, I really never thought I would see the day that I would be able to choose the recipe, because there were so many members ahead of me. Well, the day came! I was trying to decide if I should choose something decadent that I have never attempted before, like Chocolate Souffle or Pots de Creme or if I should go with a fabulous looking tart. I wanted to try one of the Bread Puddings, the Raspberry Blanc-Manger, or the most interesting looking dessert in the book in my opinion, Coconut-Roasted Pinapple Dacquoise. 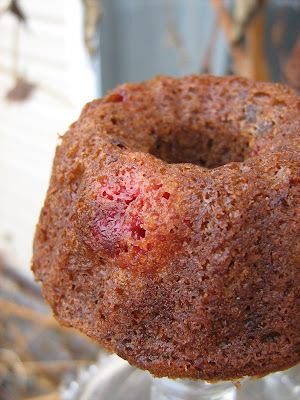 But the one recipe that I kept coming back to was the Berry Surprise Cake. There wasn't a picture, which is a little bit interesting. 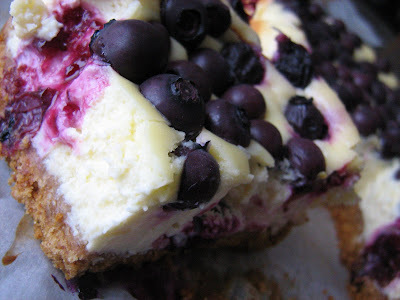 Besides, I enjoy baking cake the most and this particular cake sounded light and airy, with a fabulous contrast coming from the berries, kind of like berries and cream. I made a full recipe in my 8-inch springform pan and was careful to follow Dories instructions. She gives great instructions, with very accurate times. I let my egg/sugar mixture get just warm, beat it into beautiful, pale fluff, folded everything very gently and put my batter in the oven. It was beautiful and when I checked through the window, it had great height. When I checked a few minutes later, it had fallen a little bit. It wasn't horrible, but I wanted the cake to be perfect-so I whipped up another half batch and made it in my new 4-inch mini springform pans. Same thing. except this time I watched. I sat by the oven and saw the beautiful height and then saw them fall. Yikes! I actually asked Dorie about it and she was kind enough to respond to me in an email. She said, "Genoise cakes can sometimes sink a bit in the center - not attractive,but not really a problem with this cake, since you'll be hollowing it out and covering the top. Usually, the culprit with this cake is the folding, but it sounds as though you were gentle with the ingredients. It could be that your eggs were too hot, but I doubt that, too. The cake always rises high in the oven early on in its bake and then sinks some as it continues to bake and, as I said, it can sometimes form a dip in the center." Hey, if it isn't a problem with Dorie, it isn't a problem with me. I was relieved to find out a little sinkage was perfectly normal and decided since I had a large 8-inch and 2 small 4-inch cakes, that I would cut 2 4-inch rounds out of the large cake and use them to cover my small cakes. I sliced the 8-inch cake in half and then cut out some cute little tops. Cheating? maybe, but it worked! Topped with my cut-out round from the larger cake and Ta-da! no one will ever know, except you all, because I told you. I thought the finished cake was delicious. I let it sit in the fridge overnight and the flavors were really great the next day. This would be the perfect cake to serve at party. Yum- great pick, if I do say so myself! I hope everyone else liked it- To see if they did, go check out the TWD Blogroll! Serving: Cut the cake at the table using a serrated knife. 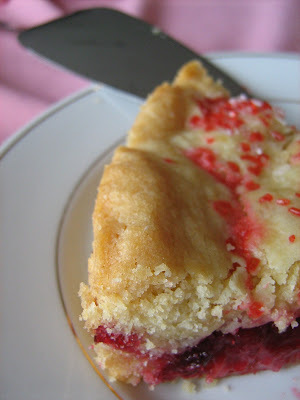 It can be served just as it is or you can drizzle a little Raspberry Coulis (page 467) over each slice. Storing: While you can bake the cake up to 1 day ahead and keep it wrapped at room temperature (a day-old cake is a bit easier to cut than a fresh cake), or freeze it well wrapped for up to 2 months, once the cake is assembled, it is best to serve it the same day. 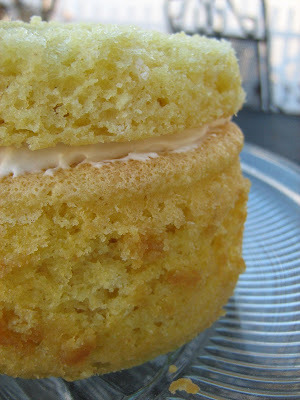 Playing Around: The filling is so good you might want to use it without the cake. If so, add sugar to it, or not, and splash the fruit with a little liqueur (eaux-de-vie, liqueurs such as Chambord or brandies like kirsch are freally good with soft fruits) if you'd like. Spoon the fruit into pretty bowls or glasses-everything looks good in champagne flutes- and top with the cream filling. "One of the great pleasures of my New York City childhood was clutching a handful of coins, walking to the luncheonette about ten blocks from home and buying a charlotte russe. 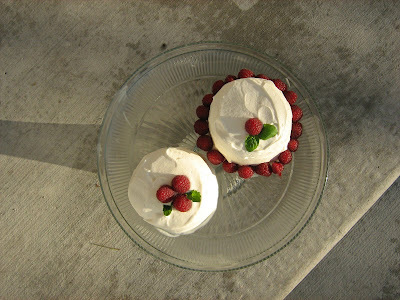 Charlotte russe, a sweet rarely seen these days, and certainly not at corner luncheonettes, was originally made of ladyfingers and custard, whipped cream, and perhaps some fruit. 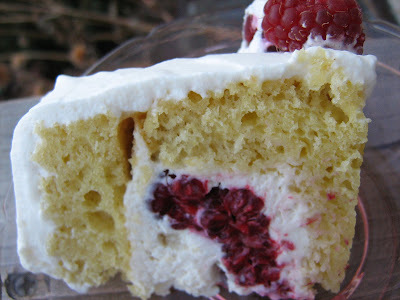 The charlotte russe of my youth was a mixture of sponge cake, fruit or jam, and gobs of whipped cream, topped by an unnaturally red cherry. But its real appeal was its packaging-the dessert came in a cardboard cylinder with a pointy rick-rack border. 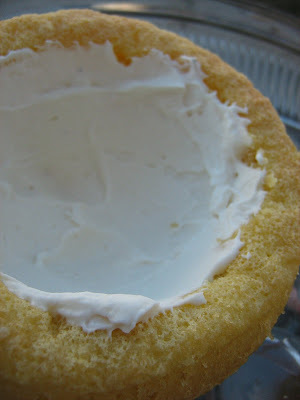 First you ate the swirls of whipped cream that extended at least a mile above the cardboard rim, then-and this was the best part-you pushed the round of cardboard on the bottom, and, in a feat of brilliant engineering, the cake rose up so you could eat every last bit of it. You could even lick the base, as I did, and so did everyone else I knew. This cake doesn't have any moving parts, but the fact that it's made by hollowing out a place in the center of the baked cake for some cream and berries is reminiscent of the spirit of charlotte russe. 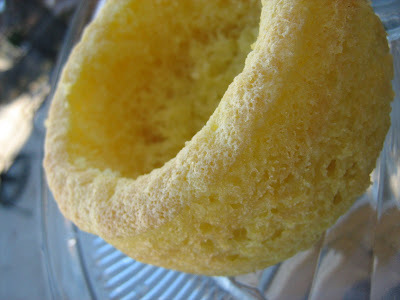 The container for this surprise is a sturdy genoise, a whole-egg sponge cake that will hold up when you cut out its center and excavate a cozy nest for the filling. 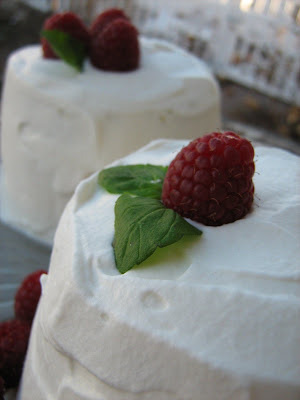 The filling, a mixture of cream cheese and heavy cream, is very simple to make, but because of the tang of the cream cheese, it tastes complex and is awfully good with red berries. 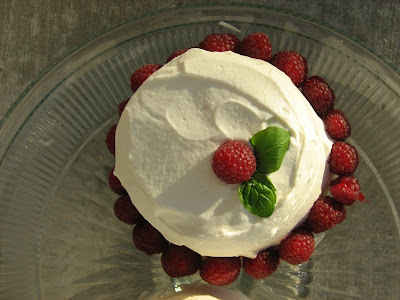 Most of the time I use raspberries as the surprise, but strawberries or a combination of berries is also fine. 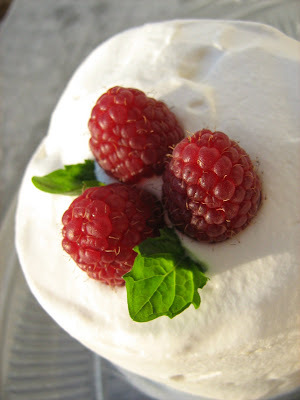 Naturally the cake is finished with whipped cream." Getting ready: Center a rack in the oven and preheat the oven to 350 degrees F. Butter a 3-inch-high 8-inch springform pan, dust the inside with flour, tap out the excess and line the bottom with parchment paper. Put the pan on a baking sheet lined with parchment paper or a silicone mat. Place the eggs and sugar in the bowl of a mixer of another large heatproof bowl and whisk to blend. Put the bowl in a skillet with an inch or two of simmering water and continue to whisk until the sugar dissolves completely and the mixture is just warm to the touch, about 3 minutes. Remove the bowl from the heat and whisk in the vanilla. Working with a stand mixer fitted with the whisk attachment or with a hand mixer, beat on medium speed for about 5 minutes, until the mixture almost triples in volume and forms a ribbon that holds it shape for about 10 seconds when the beater is lifted. Switch to a large rubber spatula, sift over half the dry ingredients and fold them in gently- don't overmix, you'll have another chance to gather up any recalcitrant ingredients. Fold in the cooled, melted butter, then sift over the remaining dry ingredients and very gingerly fold them in. The beautifully beaten eggs are fragile and must be treated like the divas they are. Check that you don't have a puddle of melted butter at the bottom of the bowl-a frequent hazard- then scrape the batter into the pan and jiggle the pan gently to even it. To make the syrup: Stir the water and sugar together in a small saucepan, bring to a boil and boil for 1 minute. Pour the syrup into a heatproof bowl. Stir in the liqueur and let the syrup come to room temperature. To make the filling: Working with a stand mixer, preferably fit with a paddle attachment, or with a hand mixer in a large bowl, beat the cream cheese at medium speed until soft, smooth and fluffy. While beating, gradually add 1/2 cup of the cream, the sugar and vanilla and continue to beat until the cream is absorbed and the cheese is smooth. Scrape the mixture into a medium bowl. Pour the remaining 2/3 cup cream into the bowl you beat the cream cheese in (there's no need to wash it) and, using the whisk attachment or the hand mixer, whip the cream until it holds firm peaks. 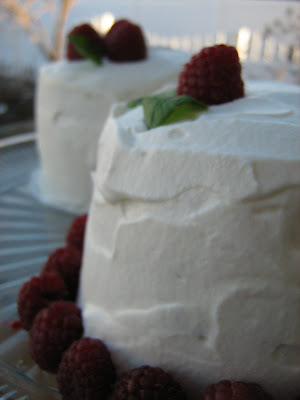 Stir about one quarter of the whipped cream into the cream cheese mixture, then fold in the rest. There's no need to wash the bowl-you'll be using it for the topping. 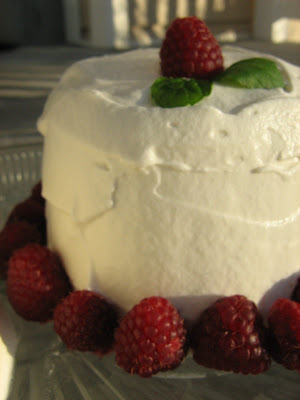 To make the topping: Just before you are ready to assemble the cake, whip the cream until it holds medium peaks. Add the sugar and vanilla and continue to whip until the cream holds firm peaks. Cover the cream and refrigerate. To assemble the cake: Using a serrated knife, slice off the top 1/2 inch of the cake and set this layer aside. If it crumbles- that can happen to the best of us- just save the pieces. 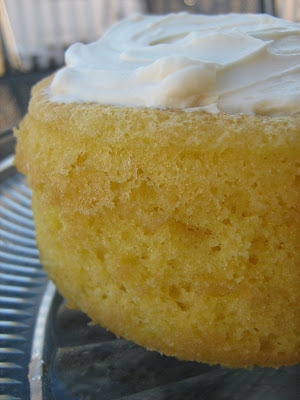 With the knife, sketch a circle on top of the cake that is 1/2 inch in from the edges of the cake. Cut down through the outline, stopping between 1/4 and 1/2 inch from the bottom. Using the knife and your fingers, carefully pull out the cake within this circle, leaving a little nest that will house your surprise. 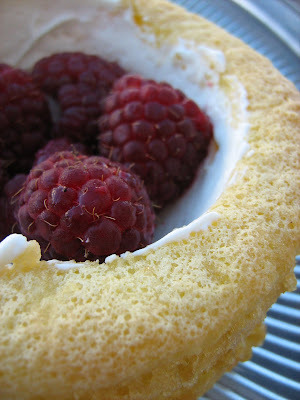 Transfer the cake nest to a platter or a cardboard round. Brush the inside of the cake with some of the syrup, discarding what remains, and spoon a thin layer of the filling over the bottom. Toss in 1/2 pint of the berries-more if you'd like- and cover with the remaining filling. Lift the reserved top layer onto the cake and press it down gently to form the cake. If all you have are scraps, fret not; just arrange them over the top of the cake and press them gently to reconstruct a layer. Using a long metal icing spatula, frost the top and sides of the cake with the topping. 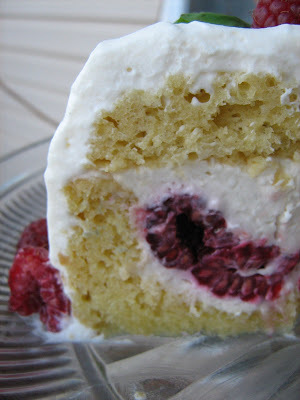 Finish with some raspberries, placing berries carefully around the top of the cake, or piling them up in the center. Refrigerate the cake for at least 1 hour (or for up to 6 hours) before serving. Up Next- The ABSOLUTE, BEST Dip EVER!